Nearly 450 students from the UMKC Health Sciences schools took part in an annual Interprofessional Education program learning activity on Sept. 7. Professional health care is increasingly a team activity. The University of Missouri-Kansas City health sciences schools are making learning a team activity as well. 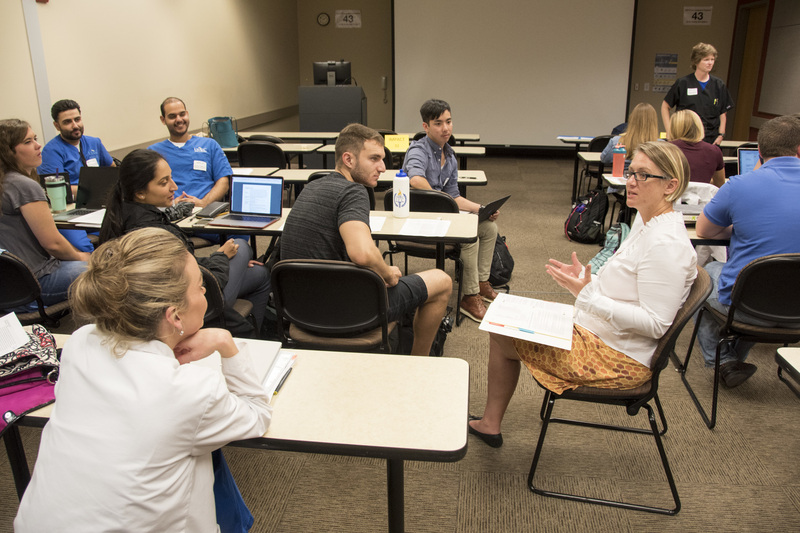 Each year, students from the schools of medicine, dentistry, nursing and pharmacy gather to participate in a series of learning events as part of UMKC Health Sciences Interprofessional Education Program. Nearly 450 students from the schools filled 49 classrooms and lecture halls across the campus on Sept. 7 to take part in small group discussions on health disparities, focusing on their particular roles in meeting patient needs. “Developing a culture of interprofessional practice and collaboration is a goal of our health professions campus in order to provide safe and high-quality care for our patients in Kansas City,” said Stefanie Ellison, associate dean for learning initiatives at the School of Medicine and a co-coordinator of the IPE program. In February, students met in Interprofessional Medical Patient Advocacy and Collaborative Teams, or IMPACTS, for the first time and completed a small group, case-based activity on roles and responsibilities. This September event is the second time they met in the same IMPACTs and they were assigned a project prior to the case-based activity. Each group was given a list of 10 areas of need such as transportation, housing, child care, job assistance or finances that can limit the ability of the lower-income and underserved populations to obtain needed health care. The groups were to research five different areas of need and come back with a list of resources to help meet those needs in material they could present to their own patients. “It is our goal to improve their learning and utilization of resources to address the health disparities or social determinates of health in Kansas City,” Ellison said. Hunter Faris, a third-year medical student who participated in the IPE program last year, served as one of the small group facilitators this year. The health sciences IPE program consists of other events including a Poverty Simulation that will take place in September and October and an annual IPE competition in the spring in which small groups of students from the different schools work together to address case-based patient scenarios and in front of a panel of judges. “These IPE events are beneficial because we understand what the other health professionals can provide and how we’re able to work together to provide care for our patients,” Faris said. Interprofessional education is implemented as part of the required curriculum across the UMKC health professions programs to meet their program accreditation requirements.